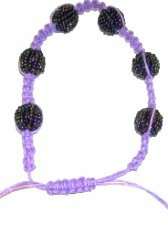 Description: This Fashion Bracelet is a popular design, and I have received many requests for a Macrame pattern. 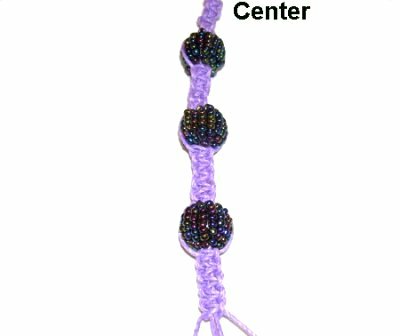 This design is similar to a Shamballa Bracelet. 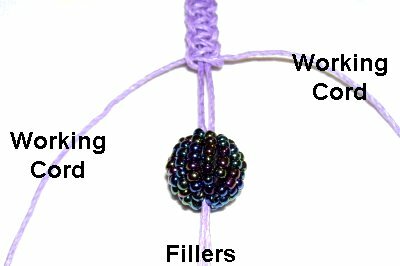 Use round beads that are not smooth, since the cords need to grip hold of them, and could slide off if they are too slick. Pave or Disco Ball Beads are great for this type of design. 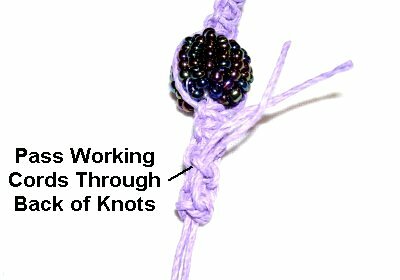 Any type of decorative knot can be used in the area between the beads, but the Square knot is the most common. 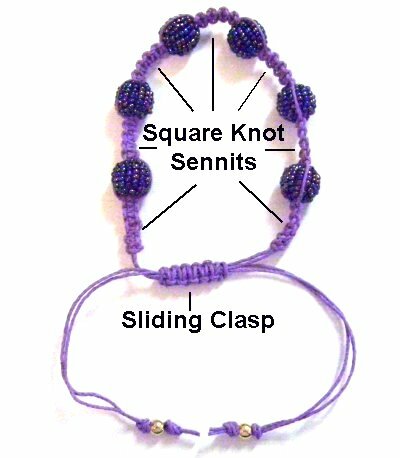 The Sliding Clasp shown below is also made with Square Knots, but you can use a different type if you wish. Cut two working cords, at least 2 yards long. Cut 2 fillers, each at least 20 inches long. For bracelets over 10 inches, cut the cords longer. Step 1: Arrange the working cords on your project board vertically, securing them at the center with tape and pins. Place the fillers between the two working cords. Tie the first Square Knot, tightening it so it rests at the center of the cords. Step 2: Tie a total of 5 Square Knots, moving from the center towards the ends. 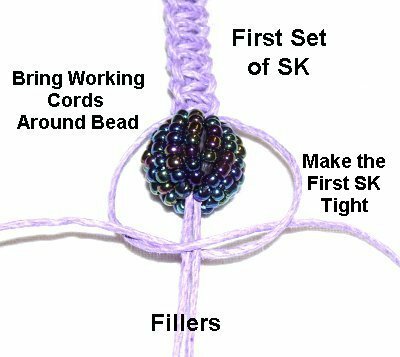 You can tie a different number of knots between the beads if you wish. 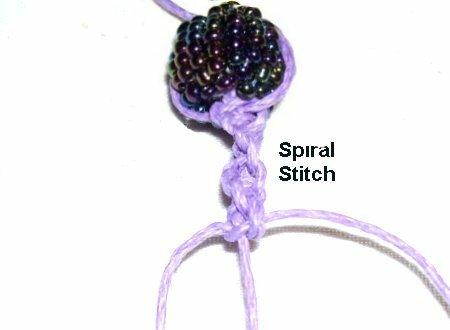 Other Options: You can use other decorative knots to make your Fashion Bracelet. Two examples are shown below. Please note that there was only one filler cord in the images below; you will have two fillers. 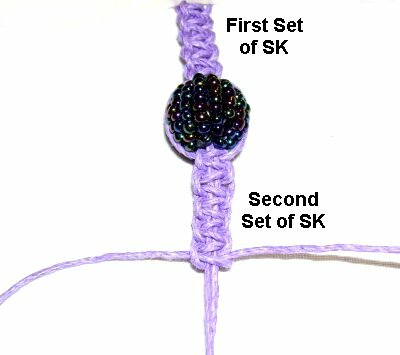 The Spiral Stitch can be tied between the beads. You tie the first half of a Square Knot over and over. This type of sennit will not lie flat. 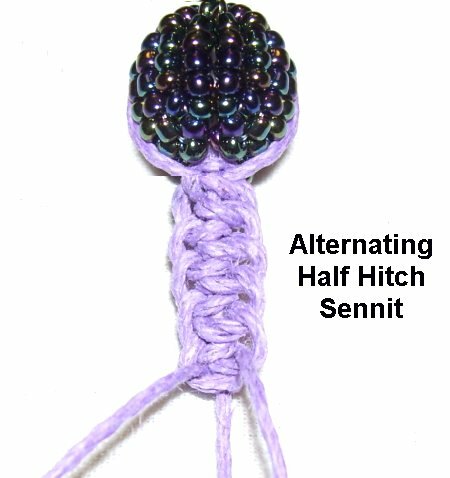 Another option is an Alternating Half Hitch design. 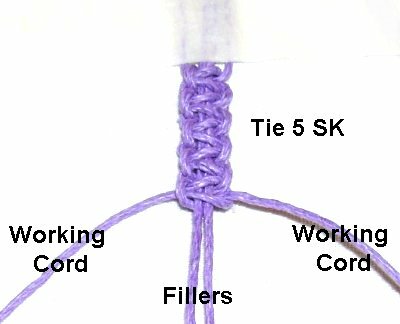 Each working cord is used to tie one Half Hitch onto the filler cords (core). 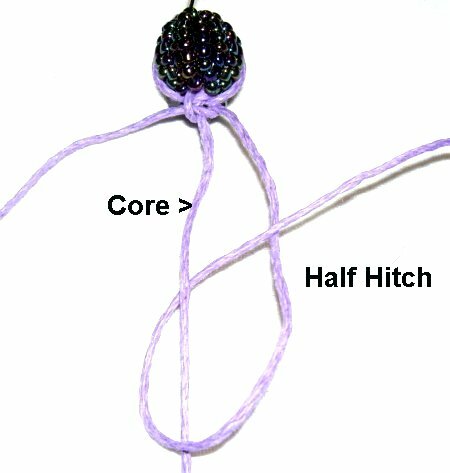 Design Tip: When using a Half Hitch design for your Fashion Bracelet, I recommend you tie a Square Knot above and below each bead. You can pull that knot tighter than a Half Hitch. Step 3: After the sennit is the size you want, add the bead onto the fillers. Step 4: Bring the working cords around the bead. Tie the next knot just below the bead, making sure the cords are pulled firmly and the knot is tight as well. Step 5: Tie the same number of knots you made in the first sennit, so there's equal amount of space between the beads. Step 6: Repeat steps 3 - 5 two times. Measure the Fashion Bracelet. It should be half the finished size you are aiming for. Add another bead if necessary. Step 7: Turn the Fashion Bracelet around. Go back to the center and repeat steps 2 - 6 to make the second half. 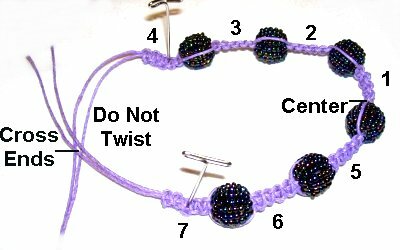 You should add the bead first, at the center, then continue. Design Option: You can add a focal bead at the center, or a fancy button. Make sure you measure the bracelet as you progress, stopping when it's the right size. Step 8: Pull the two working cords through one or more knots in the back of the last sennit. This will hold them in place. Apply glue and allow it to dry before moving on. Trim off any extra material. Step 9: Arrange the design into a bracelet shape. Cross the filler cords coming from each end of the Fashion Bracelet. Make sure nothing is twisted in any way. Step 10: To start the Sliding Clasp, cut a separate piece of material, at least 18 inches long. 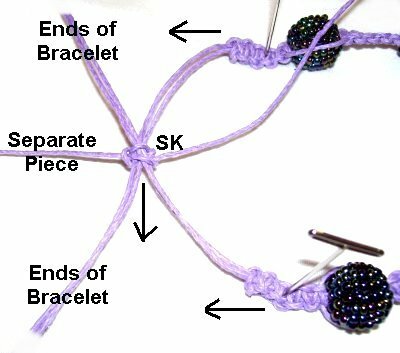 Pass it underneath the crossed area of the bracelet's ends, and center it by matching the ends. 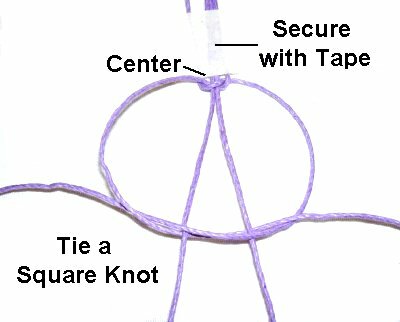 Tie a Square Knot with the new cord, tightening it in the center. It should be vertical in comparison to the bracelet, which is horizontal (see arrows). 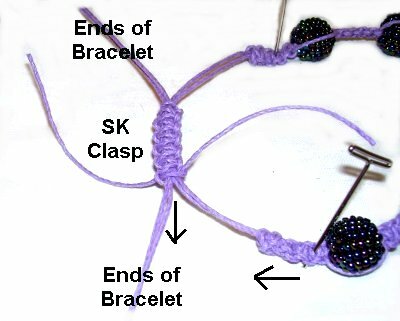 Design Tip: You can use other types of knots to make the sliding clasp for your Fashion Bracelet. For more ideas, see Sliding Clasps. Tie several more knots, until the clasp is the size you want. Finish off the cord used to make the clasp by moving both ends to the back. Tie the two ends together with a very tight Overhand knot. Add a small amount of glue, and tie a second knot on top of the first. Cut off the extra material (from the cord used to make the clasp). IMPORTANT: Don't add too much glue, or the ends will stick to the clasp and won't slide through properly. Step 11: Pull the ends of the bracelet to close the clasp. The image shows the Fashion Bracelet in the open position. Move down at least 2 inches, and tie Overhand or Barrel knots with both cords combined (each pair). You can add beads if you wish. Add glue while tightening, and cut off the excess material when it's dry. Have any comments about the Fashion Bracelet? Contact Me.